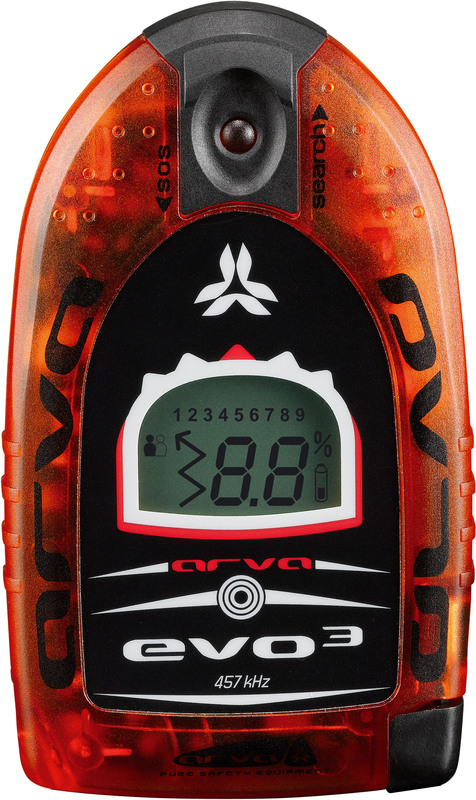 The ARVA Evo3 was discontinued in 10/2011. Summary: The now-discontinued Evo3 is basically the ARVA Evolution+ with a third antenna to resolve spikes. This is ARVA's easiest-to-use model, with distance and direction indicators. Searching: The direction indicator on the Evo3 is an LCD arrow similar to the Pieps DSPs. The audible feedback of all of the ARVA's is excellent. The Evo3's third antenna resolves spikes, but it is a little less sensitive to changes in distance when it gets closer to the transmitter during the fine search. Multiple Burials: When multiple signals are received by the Evo3, the icon appears on the screen and the transceiver locks onto the closest victim. After locating the first victim, take "one or two steps backwards" in the direction that you approached the first victim, then quickly switch from search, to transmit, and then back to search (by toggling the "nose" switch). This activates a "scan mode." In my testing of the Evolution+ multiple burial mode (a transceiver that is very similar to the Evo3), the scan mode did a good job of stating the distance to the burials, but the direction indicator was only mediocre in pointing the correct direction. Controls: The Evo3 turns on when the harness is connected. The switch that changes between transmit ("SOS") and search is reasonably intuitive. A bump of the switch conveniently changes from search back to transmit. Comfort: As with the other ARVA Evo harnesses, you'll have to remove the harness from your body before you can perform a fine search. The ARVA Evo3 transceiver is relatively large (47% larger than a Barryvox 3000, 18% larger than a Mammut Pulse, and 25% larger than a Pieps DSP Sport). Other: The owner's manual could be improved. Cons: Confusing marking of multiple burials, bulky.